In launching Summitlake.com’s new Astronomy department, we supposed it might be useful to look up the dictionary usage of this Astronomy term that we use so much in our recreational time. We found we don’t have a dictionary in the house here in Phoenix, so we used an old, cast-off Britannica. Our research didn’t teach us much about astronomy. It did teach us much about the history of those ideas. You might be surprised to learn that we’d already progressed far beyond the Mesopotamians by 1964. Most or all of what we “knew” then was accurate as far as it went. The Britannica approach is – or was – that we’re simply not going to dirty our hands by teaching you how to do anything with this subject matter. This is all just a little inconvenient when you are only looking for a definition, or the mean distance from Earth to Sun. A dictionary will tell you: 93,000,000 miles (or 92,900,000 or whatever, thank you). An encyclopedia will tell you that distance is defined as One Astronomical Unit (AU). Astronomy: the science that deals with the origin, evolution, composition, distance and motion of all bodies and scattered matter in the universe. What an encyclopedia will tell you is the origin, evolution, composition, distance and motion of the ideas underlying a topic, such as Astronomy. But, there is a definition. Is it encyclopedic? Yes. Does it tell you that the methods and principles pertaining to a thrown rotten tomato’s trajectory properly belongs to the science of Astronomy? It probably does. You would just have to know that the encyclopaedia, like anything touched by the University of Chicago, uses an Aristotelian classification system, a taxonomy or nomenclature that describes and categorizes everything by its relationship to everything else. The article begins by classifying and categorizing everything that is going to be discussed, principally history and descriptive astronomy. What follows is 10 densely packed pages, mostly the history of the conceptual development of astronomy and astrophysics, concisely and well written. This approach is useful if you want to get a feel for how humankind “put it all together” into the body of astronomical and physical knowledge we presently possess. It is also terrific for those of you with a keen interest in the etymology of ideas. If you want to learn more about the composition and physics of the Sun, that is Volume 21 where you will find four pages of remarkably up-to-date information for 1964. If you want to learn how to align your telescope on Polaris, the Polaris listing is under “Pole Star” in Volume 18. But the Pole Star listing will tell you how many stars actually comprise Polaris (3), something about where it is located with respect to Earth’s polar axis, and that it is convenient for navigators. If you know the Big Dipper and need to learn how to locate Polaris from there, though, get a book on practical Astronomy. Using an encyclopedia is quite like using any other Owner’s Manual or Help Menu. If your anti-skid braking system is locking up on an icy road, please see page 24 for further information. If your hard drive is chattering and you can’t read this because your screen has gone blue with a General Protection Fault error message, please click this link to the Troubleshooting Guide. Everything is there, but it is best to have already located the information before you really need it. We begin right away at the dawn of recorded history, refusing to waste time on unproven, anecdotal theories about StoneHenge and other early monoliths for which no sacred writings could be passed down. The ancient world learning centers generally recognized by Europeans consisted principally of Mesopotamia, Egypt, Greece and Alexandria. So the Britannica, in the style of its time, began with the history of astronomy in those city-states. 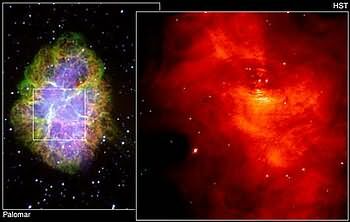 The Chinese first recorded the supernova explosion of the Crab Nebula in, I want to say, 464 AD. They had developed a systematic method of measurement and observation of the heavens, but there is no mention of China in this history. The split image to the left shows the Crab Nebula as seen by the 200 inch Palomar Hale telescope (left), and the Hubble Space Telescope (right). Ancient observers could have no knowledge of a connection between the bright supernova “visitor star” originally seen, and the faint wispy tendrils of the glowing gas remnants we see today. The Mesopotamian model of the universe was a dome rotating over a flat, disk-shaped Earth. Right away we see the problem of the “Seven Wanderers”, the sun, moon and five known inner planets that refused to stick to a fixed point on the dome model in relation to the predictable stars. The earth-based observers depicted here are using a sighting instrument believed to be an ancestor of the ancient astrolabe. 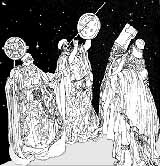 Egypt fixed a solar calendar at 365 and 1/4 days, which proved useful to Julius Caesar in establishing his calendar. Practical astronomy in ancient Egypt proved useful in predicting tides and tracking the seasons, as well as in construction of the Pyramids. The Greeks improved the single dome cosmological model to a series of concentric shells, like layers of an onion, each rotating about the center (Earth) at their own rates. The outer sphere was, of course, the star sphere. This still did not solve the problem of the Seven Wanderers. Despite now-obvious Earth-centricity flaws, the order of the inner five planets Mercury, Venus, Mars, Jupiter and Saturn appeared in the Greek model in the correct relative order . Given that the Moon, Mercury and Venus were depicted as “inside” the Sun’s orbit (as well as Earth, the center of all things), consider that it was still understood that the outer three planets Mars, Jupiter and Saturn occupied outer orbits. In other words, if tradition and religious or philosophical predispositions hadn’t obliged our distant ancestors to “switch” the position of Sun and Earth in their concentric sphere models, they would have been much more nearly correct. Many blame Aristotle for formalizing, if not inventing, the notion that all things can be correctly apprehended by “armchairing” the theory without checking either the premises or the conclusions against observational data. This little astronomical mistake wouldn’t be rectified for almost 2,000 years of mankind’s development. It took Copernicus, Kepler, Galileo and Newton around two centuries, beginning in the Middle Ages, to straighten this out. Not only did they come up with the heliocentric theory, in which the earth also rotates about its own axis once a day, they came up with the mathematical laws to describe it, and the observational data to forever change the future of astronomy and the nature of science. These scientific pioneers had to invent modern scientific methodology, the “scientific method”, to pull this off. Some of the mathematical underpinnings of all modern science are listed further below. 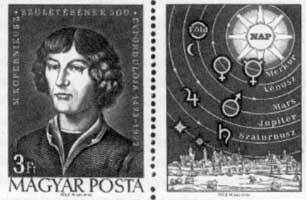 It is important to note that Kepler improved on the cosmology of Copernicus and described the basic principles of planetary orbits mathematically. 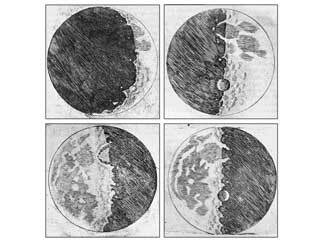 Galileo improved the observing instruments and formalized the schema of what was being observed, for which he was condemned. Newton upgraded the Keplerian mathematics to general physical principles, showing conclusively for the first time that the laws of motion, inertia and gravity apply equally to earthbound and celestial objects. As we know, these astounding accomplishments were not at all well received in officialdom. Seats of power resented physical relocation to satellite orbits in the grand scheme of things, but we were least spared from hearing once again the agonizing tale of the forced Galilean recantations. Amateur astronomers know that for modern telescopes we owe much to Galileo and Newton (but also to many others) for fitting together curved glass lenses to produce the first telescopes. Most disturbing was the fact that these primitive instruments made nearby objects, like the Moon and Saturn, appear larger and brighter, but the most distant, the stars, did not increase in apparent size, only in brightness and the number visible. This implied that the stars were much farther away than previously thought. Early telescopes were built up to an unmanageable 100 feet tube length, to minimize optical distortion by limiting the field of view to a very narrow cone. Newton solved the problem of spherical and chromatic lens aberration by inventing the reflector telescope instead. I did not know it was he who announced that the combining of different types of glass to make compound lenses could not be used to correct these kinds of optical distortion; this set back the making of modern refractor scopes several decades. Newtonian reflector telescope designs are also still very modern to this day. The squares of the periods of revolutions of any two planets are in the same proportion as the cubes of their mean distances from the sun. Newton’s contribution to mathematics and physics, the laws of motion, was at least as momentous for astronomy (and remains to this day a bane of school kids). 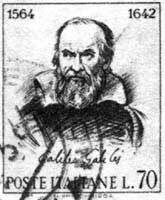 He also formalized the laws of gravity, once again refining the experimental results of Galileo and the mathematics of Kepler. If no force is exerted on an object, there is no acceleration. Without the action of an outside force, bodies at rest remain at rest; bodies in motion do not change speed or direction. The force exerted on an object can always be described as being its mass times its acceleration, or rate of change in velocity. These concepts seem so intuitive today because we learned to think about the motions of the physical universe around us in these terms. They made it possible for our predecessors to impose sense upon the layered concentric sphere models of earlier centuries. As an instant bonus, the motions of the “Seven Wanderers” became not only explicable, but subject to the same measurement and mathematical predictability as those stars on the outer “sphere”. Astronomy’s new thinking and measurement tools laid the foundation for an explosive advance in the body of knowledge and observational data to back it up. These advances weren’t just happening in astronomy, but in math, physics, aerospace and technology, and scientific instrumentation, to name a few. In 1903 5,822 stars were found close enough (about 300 light years) that we could measure their distance through parallax – an apparent shifting of position as the Earth circles Sol over the course of a year. From that, absolute magnitudes of brightness for various star types and sizes could be fixed. From that, with the aid of spectroscopy and photovoltaic brightness measurements, the distance of even more remote stars could be accurately estimated. How descriptive and accurate is a 1964 encyclopedia article compared to the 2003 body of knowledge? The composition and nuclear chemistry of the sun and sunlike stars was already well understood, as was hydrogen fusion. The expansion of the universe had already been measured. The bodies and orbits of our own solar system had long since been explained, and I was surprised at the level of detail inferred about the composition of those bodies. For example, it was understood that while Jupiter has hydrogen and helium in about the same proportions as the sun, gravitational” compression” must mean that Jupiter’s core was a solid. I was amused to see Britannica speculation that green blotches on the surface of Mars may be growths of lichens in lava basins. You can’t win them all. Also, a modern understanding of the formation of nebulae and stars was hinted at, but had not yet hit the status of “theory” in this 1964 compendium. There was no mention of the contributions of Einstein to an understanding of the universe, perhaps in part because his contributions went far beyond the discipline of astronomy, or even of math and physics (it unified them in a fundamental way). Mainly, you have to remember that this would be in Volume 8 under “Einstein”. In the encyclopedia, it is all there – Einstein, Huygens, Galileo, Newton, the Sun, Quantum Mechanics — but there is no mentor reading over your shoulder. You have to know when and where to look for it. The explanation of the development of spectroscopy increased my lay person’s understanding of how dark spectroscopic bands could be connected to their origins in the earth’s atmosphere, or the sun’s corona, or the solar surface itself – gaining valuable data about the composition of those various filtering layers. This formed a solid basis for drawing conclusions about the spectrums of other stars, as well as for measuring and cataloging the famous “Red Shift” — the first strong evidence that the universe is expanding. The Britannica did a good job with radio astronomy, covering the early discoveries at Jodrell Bank of discrete radio sources in Cygnus (the Swan) and the Crab, to name a couple. It had a very good section on celestial mapping, including the zeniths and equinoxes (which I am always forgetting faster than I can learn it). The structure and star population of our neighboring Andromeda Galaxy (M31) was discussed in some detail, including a comparison of similarities in star types in the two spiral galazies. There was a token end section on amateur astronomy, recommending a 2″ refractor or 6″ reflector for the beginner, which very nearly remains the norm 40 years later. 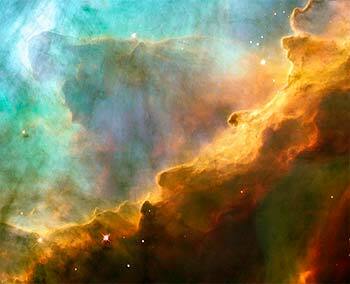 In 1964 there was no Hubble Space telescope, which today is still providing astounding evidence that the universe is knowable, explainable and beautiful. Without the scientific leaps outlined in the encyclopedia article I grabbed, Hubble’s construction and launching would have been impossible. Had we still somehow been able to obtain its magic glimpses into the maw of the Swan Nebula, or the crackling radiation of the Crab, we would have been utterly unable to interpret what we saw. Mathematics and the scientific or “experimental” method makes it possible for us to forget or never quite learn the principles underlying what we observe in the heavens today. We can talk knowledgeably today of oceans of methane, hydrogen and helium that compress a gravitational core of gases to above-metallic densities, then igniting deuterium fusion, then (if the object’s size and mass is great enough) blossoming into a blinding blue-white hydrogen-fueled star. Without necessarily understanding the nuclear physics involved, it helps to have an appreciation of what we as a species do know about it, and how we came to know it. We don’t know it all, and I hope some day other readers will look with bemusement on our primitive theories of Dark Matter, Dark Energy and such. It wqould also be nice to know what “really” lies on the other side of the Event Horizons of black holes. I poke fun at the encyclopedic “the head bone is connected to the neck bone” approach to knowledge. It has its uses. Evolutionary biology is connected to biology, physics, mathematics, archaeology and geology. Law is connected to philosophy, logic, rhetoric, statistics, politics and history. We’ve discussed how astronomy is connected to mathematics, mensuration (measurement), physics, and (to some extent) to geology and statistics. You couldn’t stifle knowledge of one discipline without suppressing them all. All in all, I’m glad I was able to take the time to pick up the encyclopedia and trace the connections through just a few of the topics.